A simple chocolate cookies with cherry for this Christmas. Infact it is ideal for any occasion. A must for chocolate lovers! 1. Sift the flour, cocoa powder and baking soda in a bowl. 2. Mix the butter and sugar in a bowl. Whisk until creamy. 3. Add the coffee and beat until smooth. 4. Add the flour mixture, cherries, nuts and chocolate chips. 6. Scoop out small balls and place them on a baking tray lined with parchment paper. Flatten them lightly. 7. Bake for 8 to 10 minutes in a preheated oven at 350F. 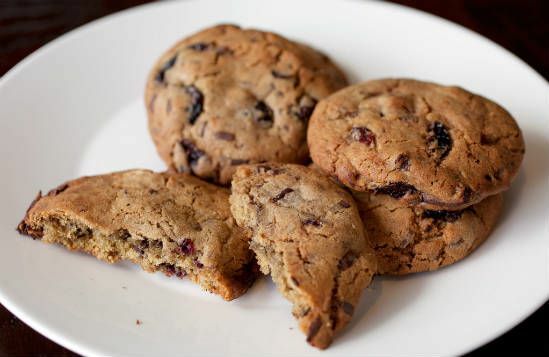 Feel free to comment or share your thoughts on this Chocolate Cherry Cookies Recipe from Awesome Cuisine.